The new bathymetry data produced by the project have also yielded improved morphometric information of Lake Baikal. A selection of this new information is presented on the CD-Rom. Images are in .jpg image file format and they can thus be handled by most software applications. The maximum sounded depth of Lake Baikal is 1642 m. The coordinates of this point are N 53° 14' 59" - E 108° 05' 11". Considering that the lake surface is at 455.5 m above sea level, the deepest point of Lake Baikal is at 1186.5 m below sea level. The maximum sounded depth of the Northern Basin is 904 m. The coordinates of this point are N 54° 20' 43" - E 108° 42' 53". The maximum sounded depth of the Central Basin is 1642 m. The coordinates of this point are N 53° 14' 59" - E 108° 05' 11". The maximum sounded depth of the Southern Basin is 1461 m. The coordinates of this point are N 51° 46' 32" - E 105° 22' 03". 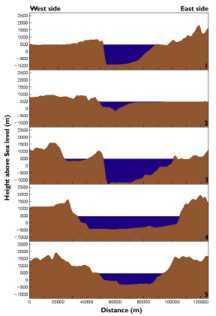 Below are a number of bathymetric cross sections through Lake Baikal. Vertical exaggeration is 100 times. Map with location of cross sections. The total volume of water contained in Lake Baikal is 23615,390 km3. The total volume of water contained in the Northern Basin is 8192,070 km3. The total volume of water contained in the Northern Basin is 9080,650 km3. The total volume of water contained in the Northern Basin is 6342,670 km3. 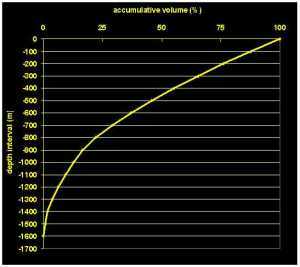 The following graphs illustrate the volume of water contained in depth intervals of 100 m (left), the accumulative volume by depth interval increments of 100 m in km3 (center) and the accumulative volume by depth interval increments of 100 m in % (right). The total surface area of Lake Baikal (islands not included) is 31722 km2. The total surface area of the Northern Basin is 13690 km2. 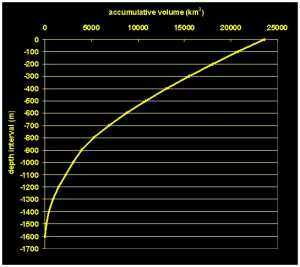 The total surface area of the Central Basin is 10600 km2. The total surface area of the Southern Basin is 7432 km2. The total surface area of Lake Baikal at 100 m water depth is 27770 km2. The total surface area of Lake Baikal at 200 m water depth is 26290 km2. The total surface area of Lake Baikal at 300 m water depth is 24890 km2. The total surface area of Lake Baikal at 400 m water depth is 23260 km2. The total surface area of Lake Baikal at 500 m water depth is 21530 km2. 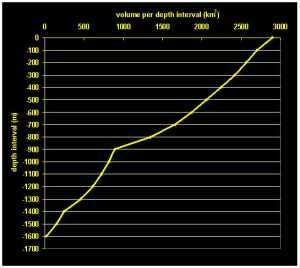 The total surface area of Lake Baikal at 600 m water depth is 19630 km2. The total surface area of Lake Baikal at 700 m water depth is 17720 km2. The total surface area of Lake Baikal at 800 m water depth is 15360 km2. The total surface area of Lake Baikal at 900 m water depth is 9443 km2. The total surface area of Lake Baikal at 1000 m water depth is 8478 km2. 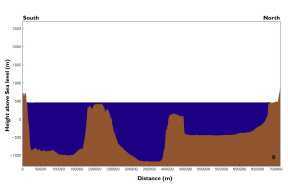 The total surface area of Lake Baikal at 1100 m water depth is 7703 km2. The total surface area of Lake Baikal at 1200 m water depth is 6614 km2. The total surface area of Lake Baikal at 1300 m water depth is 5428 km2. The total surface area of Lake Baikal at 1400 m water depth is 3562 km2. The total surface area of Lake Baikal at 1500 m water depth is 1798 km2. The total surface area of Lake Baikal at 1600 m water depth is 1091 km2.